Nearly a year after its closure, the landmark Penny Farthing Tavern is set to reopen in Oldtown Salinas by Friday. It could open earlier in the week, owner Huw Thomas said, but Friday carries a special urgency. "The Salinas Jaycees are having a pub crawl that day," Thomas said. "I can't see why we wouldn't be open." Over its 25 years in business, the Penny Farthing found a special place in the hearts of customers such as Brian Courrejou, who can't wait to go back. "Every Friday and Saturday night that was the place to go in Salinas," he said. "You'd see everyone you knew. It was almost like this town's 'Cheers.'" "The outpouring has been incredible," Thomas said. "People stopping by and saying, 'When are you opening?' "
The tavern is creating 22 new jobs, most of them full time. Final building and health inspections, which Thomas expects to go smoothly, are the final hurdle. The business has been shuttered since May, when owners Mark Oliver and Amanda Oliver entered Chapter 7 bankruptcy. It was opened in 1984 by British natives Peter Blackwell and Tony Sutton-Deakin. Thomas, who managed it from 1986 to 1993, is president of Dunwoody Restaurant Group in Georgia. He owns seven pubs in the Atlanta area. Another Penny Farthing fan, city planning commissioner Steve McShane, said he expects 200 to 250 people at Friday's pub crawl, which has a St. Patrick's Day theme. The event, open to the public, starts at 7 p.m. at Bankers Casino before hitting six more Oldtown Salinas bars and restaurants. "This reopening is meeting with a lot of excitement," McShane said. "It's got a history. It's been real popular among the young professional crowd, a great place to go after work." The Penny Farthing's new general manager and operating partner, Desmond Carreras, is a trained chef and self-described "foodie." The 39-year-old grew up in that kind of family. Both his parents opened restaurants. He's worked for various eateries, among them The Palace in Gonzales and Russo's Seafood Palace and Oyster Bar in Salinas, which occupied a building near the train station that no longer exists. Carreras is also a partner in a gourmet jam and preserve business, Tuck Box, named for a Carmel restaurant. He's done catering, too. Thomas and his wife met Carreras one night over drinks in Carmel and asked if he knew anybody who could manage the Penny Farthing. "I always loved the Penny, and I loved the idea that they wanted to make it a restaurant," he said. "I'd love to run it, here I am." 19 Newly fabricated cuts of meat (e.g. A Trip to Tuscany .. will be a vacation for your taste buds! Chef Michael of Michael's on Main will be cooking slow roasted chicken, root vegetables seasoned and roasted and of course, penne pasta primavera. With Kevin McDowell playing his guitar you'll feel like you have been transported to Tuscany. Otter Cove Wines will be pairing up with our Italian delights. Otter Cove Wines is produced with Monterey County grapes. They are able to bring some great tasting wines to Monterey Bay Area and beyond. Otter Cove and Richard Oh pride themselves with quality products at a great price. Richard brings his passion for wines and food pairings and seeks to bring great joy to others by producing what nature gave us. OhZone at Verve Lounge, Aptos Friday 8 p.m. to 1 a.m.
Richard Oh, creator of OhZone Spirits, will be behind the bar mixing up drinks. Some favorites like OhGasm, Sugar Daddy Oh, Ohasis, and LemOhn Drops... We will have two Dj's and a light show. Come join us for a fun night full of Oh! Lots of drinks, dancing, music, cool people, and fun!!! Chef Velis and Richard will be coming up with a special menu for this event. 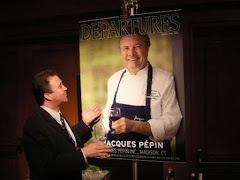 One of Richard's specialty is pairing wine and food. This will be a great event. Menu to follow later. Like many others who have traveled the world in search of Nirvana, Andre Lemaire finally settled in Carmel with a contented sigh. 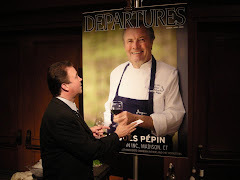 After 50 years working as a chef — from Paris, to Moscow, to Corsica, to Palm Beach, to Las Vegas, to Fresno and beyond — Lemaire hopes he won't ever have to pack his knives again. "Who wouldn't love it here?" asks Lemaire, 65, who delights in calling himself an "old guy with old bones" who wouldn't know what to do if he retired. Lemaire is the chef-owner of Andre's Bouchee Bistro and Wine Bar, adding his name 10 months ago to the established and esteemed Bouchee Bistro owned by David Fink (Aubergine, Cantinetta Luca). It's a family affair for the Lemaires, with Andre's son Stephan helping behind the stove during lunch and waiting tables at night, and wife Elizabeth working the front of the house along with her daughter Lauren. Some of the previous staff remains, including wine director Dimitri Ruban, who helped construct the restaurant's 5,000-bottle, 620-label wine list, an eclectic collection of French and Californian varietals. The food is classic French mixed with what Lemaire calls "California flair." Not a big fan of nouvelle cuisine taken to the extreme — "Who wants to eat monkfish with chocolate sauce?" he moans — Lemaire sticks close to tradition. Like-minded diners will enjoy the menu of foie gras, duck confit, escargot, sweetbreads and cassoulet. Lemaire hails from the old school, with pupils who see snails as more than garden pests, believe foie gras is healthier than a cheeseburger, and who ensure longevity by drinking a glass — or three — of red wine every day. The menu is small, with fewer than 10 starters (including soups and salads), five fish entrées and five meat entrées, along with a few daily specials. Dessert includes a classic cheese plate, along with sweets such as profiteroles, cr me bržlée and apple tart. Livermore, CA (Vocus/PRWEB ) February 18, 2010 -- U.S. Foodservice-San Francisco, the only green-certified broadline food distributor in the state of California and one of a handful across the country, is now running its entire delivery fleet on biodiesel fuel. We take our commitment as a green certified business very seriously. That means that reducing our environmental footprint is a key component of our business strategy. All of the San Francisco division’s 136 tractors and 148 trailers began using B5 fuel last month, a blend of diesel containing 5 percent biodiesel, a form of diesel fuel made from vegetable oils, animal fats, or recycled restaurant greases. (In this case, the 5 percent is soybean oil.) Biodiesel is a sustainable, renewable alternative to diesel fuel which can dramatically reduce greenhouse gases and other emissions. The biodiesel fuel costs on average about two cents more per gallon than diesel fuel. Its use is expected to reduce the U.S. Foodservice-San Francisco fleet’s carbon dioxide (CO2) emissions by 333 metric tons – or 734,000 pounds – annually. That’s roughly the equivalent of taking 65 cars off the road or of planting more than 3,000 trees every year. The biodiesel is locally sourced and refined, a product of Western States Oil, San Jose. *Reducing electrical consumption by 37 percent with the use of T8 fluorescent lamps in its warehouse operations. *Decreasing landfill waste by more than 1 million pounds since 2007. *Increasing recycling of materials such as cardboard, paper and shrink wrap by more than percent each year since 2006. *Recycling water from refrigeration units. Among honors for these efforts, U.S. Foodservice-San Francisco was recognized by the East Bay Economic Development Alliance as the 2007 Stop Waste Top Performer, by the Livermore Chamber of Commerce as the 2007 Business of the Year and by Pacific Gas & Electric in 2008 as Climate Smart and Carbon Neutral. San Francisco is the fourth U.S. Foodservice division to use biodiesel in its fleet. It joins divisions in Atlanta, Streator, Ill., and Plymouth, Minn.
U.S. Foodservice is one of the country’s premier foodservice distributors, offering more than 43,000 national, private label and signature brand items and an array of services to its more than 250,000 customers. The company proudly employs 25,000 associates in more than 60 locations nationwide who are poised to serve customers beyond their expectations. As an industry leader, with access to resources beyond the ordinary, U.S. Foodservice provides the finest quality food and related products to neighborhood restaurants, hospitals, schools, colleges and universities, hotels, government entities and other eating establishments. To find out how U.S. Foodservice can be Your partner beyond the plate®, visit www.usfoodservice.com. 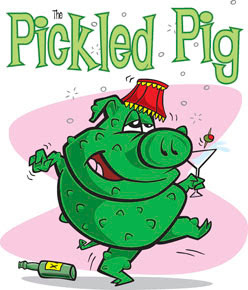 State fire investigators spent today at a Louisiana plant that sold pickled pigs' lips by the gallon through grocery and convenience stores around the Southeast. Arson unit supervisor Donald Carter said they don't yet know what started the fire. It broke out Monday, when Farm Fresh Foods Suppliers in St. Helena Parish was closed. The plant between Pine Grove and Montpelier made and packaged gallon jars of snacks including pickled eggs and pork lips, feet and hocks, and smaller jars of those and of pickled sausages and quail eggs. It sold direct to stores within 150 miles of Mobile, Ala., and to chains including Wal-Mart, Winn Dixie and Piggly Wiggly. Plant manager Matthew Dufour says that the interior was largely gutted, and much of the roof collapsed. A tagged blue crab was recorded swimming 35 miles in 48 hours. Great menu ideas start as a special and then add the more popular items to the menu! Chicago Business ©2010 by Crain Communications Inc.
Grilled cheese is a comfort-food staple that prompts memories of grade school — but it needn't be childish to be delicious. Forget artificially yellow slices on dull white sandwich bread. Several downtown restaurants take a stab at updating the classic, and here we bite into our favorites that you can eat with decorum (really) in front of clients. And there's even more on the way: We're eager to try the grilled cheese of the day ($8) at newcomer Purple Pig, as well as the trio of grilled cheeses ($12) expected to debut at Bin 36 by month's end. At One Sixtyblue, chef Martial Noguier ran one of the city's most impressive cheese programs, and here he brings along his zest for composed fromage plates in the unsuspecting form of a sophisticated grilled cheese. Hunks of yellow buck Camembert — every inch the buttery double creme you want it to be — are napped with honey truffle butter and sandwiched between thick, pillowy slices of house-made brioche toast ($12). Crystalline, transparently thin apple chips and a scattering of frisee with hazelnuts do their best to assert that this elegant cheese plate is actually a lunch entree — but we know better. Beyond grilled cheese, there's much to love on Cafe des Architectes' lunch menu. Since Mr. Noguier rebooted the restaurant last year, seasonal and local products star, along with clear, robust flavors. Tuna tartare ($11) gets a fiery sweet hit from piquillo peppers, cooled down with avocado. Bouillabaisse broth ($9) delivers concentrated, layered seafood flavor, heightened and refined by swirls of saffron yellow aioli. Bistrot Zinc rounds out its lunch menu with plenty of French classics, two of which never fail us: mussels steamed with white wine and cream ($13) and a daily quiche with salad that makes a perfect light meal ($12). State & Lake's grilled cheese and soup combo captures the best of the childhood version — buttery, crunchy sandwich oozing with cheesy goodness; spoonfuls of warm, creamy soup — then adds a chef-driven twist. Rustic sourdough slices, toasted up crisp and brown, encase a thick layer of Gruyere and mozzarella cheeses (the first adds sharpness, and the second melts like a dream). It's matched at the moment with a bowl of the restaurant's creamy yet creamless cauliflower soup spiced with curry ($10). Only male Dungeness may be kept. This is true throughout the United States. In 1897 possession and sale of female Dungeness was prohibited. The site of the Ol' Factory Cafe in Sand City will no longer be a restaurant. Building owner Robbie Robinson said he is expanding his business, Carmel Stone Imports, into the space vacated by Ol' Factory. The restaurant was in the same building as Robinson's business at 1725 Contra Costa St., in the city's West End. Ol' Factory closed last fall. Most popular choices of takeout/delivery items on Super Bowl Sunday are pizza at 58 percent, chicken wings at 50 percent and subs or sandwiches at 20 percent. Approximately one in 20 (4 percent) Americans watch the big game at a restaurant or a bar, over 9 million Americans. On Super Bowl Sunday, Americans will eat an estimated 20 million pounds of potato and tortilla chips and eight million pounds of avocados. Sales for antacid increase by 20% on Super Bowl weekend. The Food Network will have aired at least a dozen shows with Super Bowl themes by Super Bowl week's end. ROSEMONT, Ill., Jan. 26 /PRNewswire/ -- U.S. Foodservice has launched two new websites to help restaurant operators improve sales and efficiency by leveraging industry best practices. Foodsight™ (www.usfoodsight.com) and Beyond the Plate™ (www.beyondtheplate.com) offer articles, tools, testimonials, product solutions and interactive features created to assist foodservice professionals in building their business. The digital resources inform, educate, inspire, train and connect restaurant operators with peers and consumers. "Foodsight is based on our 150 years of experience in the industry and offers insightful, incisive and inciting information for the foodservice professional," said Mark Eggerding, senior vice president, Street Sales, U.S. Foodservice. "The Web site includes the most insightful research in the industry and incisive recommendations that will incite restaurant owners to pursue a higher level of success." •Resources: Valuable partner links and program information. Beyond the Plate is an on-line, interactive resource center where foodies and professionals can learn about and discuss new products, marketplace trends and the art and enjoyment of good food. Visitors can access a wide range of food information, including recipes, training videos and interesting articles about food, dining and the culinary lifestyle. There is also a special "Ask the Chef" feature where visitors can get answers to their questions from U.S. Foodservice expert chefs. "Whether you are a home cook, food enthusiast or own a restaurant or catering company, you will find tips that will help you become the most knowledgeable person out there when it comes to food," Eggerding says. This quarter, both Foodsight and Beyond the Plate are focusing on disposables and environmental sustainability. On www.usfoodsight.com, restaurant operators learn how to increase sales from their takeout menu, how to profit from their catering business in the new economy and the benefits of going green. Plus, visitors have access to the latest in sustainable packaging, and sell sheets as well as rebates for U.S. Foodservice disposable products. Visitors to www.beyondtheplate.com can take a survey on their use of and feeling toward disposables, and get recipes and other information on food and related products that are environmentally sustainable and perfect for entertaining. Content is updated regularly to keep both sites fresh and relevant. U.S. Foodservice is one of the country's premier foodservice distributors, offering more than 43,000 national and signature brand items along with an array of services to its more than 250,000 customers. The company proudly employs 25,000 associates in more than 60 locations nationwide who are poised to serve customers beyond their expectations. As an industry leader, with access to resources beyond the ordinary, U.S. Foodservice provides the finest quality food and related products to neighborhood restaurants, hospitals, schools, colleges and universities, hotels, government entities and other eating establishments. To find out how U.S. Foodservice can be Your partner beyond the plate®, visit www.usfoodservice.com. The stabbing took place at the Radisson Hotel in Sacramento on Sunday, January 24, 2010. An argument over a chef's hat escalated into a bloody knife attack in front of shocked guests at a Sacramento hotel this weekend, leaving one chef seriously injured and another on the run, according to authorities. The suspect and victim both worked at the Radisson Hotel on Leisure Lane, according to authorities, and an argument between the two spiraled out of control on Sunday. 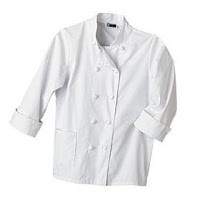 The suspect was allegedly angry with the victim for not wearing his chef hat and began cursing at him. "I think it escalated so quickly that others didn't realize it was going to become violent," said Sacramento Police Department spokesperson Laura Peck. The suspect picked up an eight-inch filet knife and stabbed his colleague repeatedly, according to witnesses. An army recruit and two off-duty police officers came to the aid of the stabbing victim as the suspect allegedly left the scene through a back door at the hotel. He has not yet been located by investigators. The victim, who has not been identified, was hospitalized but is expected to survive. An ancient "grain" native to South America, quinoa has been cultivated in the Andean mountain regions of Peru, Chile and Bolivia for over 5,000 years, and it has long been a staple food in the diets of the native Indians. The Incas considered it a sacred food and referred to it as the "mother seed." Not only is quinoa high in protein, but the protein it supplies is complete protein, meaning that it includes all nine essential amino acids. Not only is quinoa's amino acid profile well balanced, making it a good choice for vegans concerned about adequate protein intake, but quinoa is especially well-endowed with the amino acid lysine, which is essential for tissue growth and repair. In addition to protein, quinoa features a host of other health-building nutrients. Because quinoa is a very good source of manganese as well as a good source of magnesium, iron, copper and phosphorus, this "grain" may be especially valuable for persons with migraine headaches, diabetes and atherosclerosis. We usually think of quinoa as a grain, but it is actually the seed of a plant that, as its scientific name Chenopodium quinoa reflects, is related to beets, chard and spinach. These amino acid-rich seeds are not only very nutritious, but also very delicious. Cooked quinoa seeds are fluffy and creamy, yet slightly crunchy. They have a delicate, somewhat nutty flavor. While the most popular type of quinoa is a transparent yellow color, other varieties feature colors such as orange, pink, red, purple or black. Whisk together lime zest and juice, butter, oil, sugar, 1/2 teaspoon salt, and 1/4teaspoon pepper in a large bowl. Blue crab is the only crab that is eaten in both the hard and soft-shell form. Book Your Valentine's Dinner Now! Keeping up with our normal Sunday Tradition, we are going to do HAPPY HOUR ALL DAY! That's right you heard it, HAPPY HOUR ALL DAY! That means $3.00 well drinks ALL DAY, $3.00 pints of beer ALL DAY (27 of them) and 1/2 priced appetizers ALL DAY! So the only question left for all you is, what time are you going to get down to the BIGGEST SUPER BOWL PARY in Monterey??? 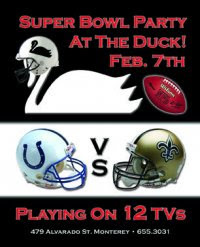 See you all at THE MUCKY DUCK, WHERE MONTEREY MEETS for FOOTBALL! 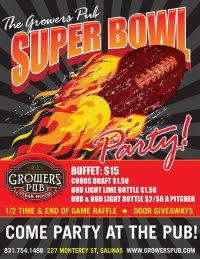 Grower's Pub in Salinas is featuring Chef Hector's all you can eat buffet for the Superbowl with burgers, fries, hot wings, jalapeno bottle caps, potato skins, and nachos all for only $15.00 a person. Check out the event on Facebook. Or visit them online at www.growerspub.com. Growers Pub pays homage to the agricultural history of the city with a tantalizing menu, mouth watering entrees, and world class spirits. 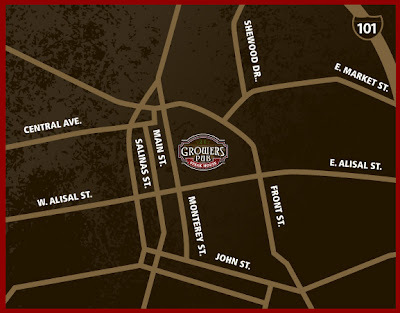 Located in the same historic building that was once home to a legendary Salinas steakhouse and bar, Growers Pub features a nostalgic atmosphere, including the original 1940's bar, wine from local vintners and a classic menu that captures the true essence of the region. Join us to enjoy fabulous food, friends, and fun while you celebrate the heritage of Salinas Valley in our family friendly Old Town Pub. 8 LG T.V’S 3 HUGE SCREENS 1 10X15FT SCREEN SURROUND SOUND THROUGHOUT! FREE GIFT AT THE DOOR!!! FEBRUARY 7TH DOORS OPEN AT 12:00 NOON $25 COVER INCLUDES ALL YOU CAN EAT KULA BUFFET 2:00PM-END OF GAME ( 5HRS OF FOOD) NO TAKE OUT! DRINK SPECIALS THROUGHOUT THE GAME!!!!! Kula Ranch Island Steakhouse (in the former AJ Spurs/ RJ Location) is located at the Marina Sanctuary Resort, next to the Marina State Beach, just off Highway One at Reservation Road. As you drive up the brick-paved entry of the Resort, and circle around to the palmtree lined entry to Kula Ranch, you will begin to feel the Hawaiian Paniolo feeling of the Islands. The beautifully remodeled Kula Ranch, brainchild of popular local restaurateur Joe Loeffler (former General Manager of Baja Cantina) features a soothing Island feel, mixed with a little up-Country Western Maui! Executive Chef Darroll Rose (formerly of Fresh Cream Restaurant) has developed an enticing menu of Pacific Rim inspired fresh seafood, steaks, prime rib, exciting Sushi Bar creations, exotic salads and fabulous appetizers and desserts. We look forward to seeing you soon….and often!! The food and wine sales rep is a great, although often untapped, resource for the restaurant owner or manager as an extra source of eyeballs on their operation. Last week at dinner we had a server that offered us three items as specials-that weren't specials anymore. 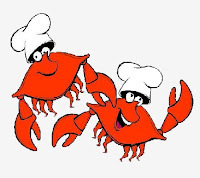 After explaining our options and pricing on two crab dishes we chose an À la carte $25.00 King Crab meal that he charged us $45.00. Then he argued with us when we corrected him. Just yesterday as I sat in one of the 10-15 different restaurants I visit in a day, a couple was seated in a booth across from me. They asked the server what the specials were and were told to "Wait I have to go read it because I can't remember anything today". They ordered and the gentlemen requested a side of blue cheese dressing for his fries. Same server said "can you ask me for that again when your meal comes?" In a way I think it was good that server recognized his limitations, however I think as a guest it might have been lot of work compensating for his inability to multi-task. What are your pet peeves? What irritates you when you are out? I often find industry insiders are more opinionated on this matter as true professionals hate to see sloppy habits. Let us hear from the servers, bartenders, managers, and owners too? Also read this blog from Bruce Buschel as he was planning to open a seafood restaurant. Attached are his two part list of do's and dont's for servers. Herewith is a modest list of dos and don’ts for servers at the seafood restaurant I am building. Veteran waiters, moonlighting actresses, libertarians and Batistas will no doubt protest some or most of what follows. They will claim it homogenizes them or stifles their true nature. And yet, if 100 different actors play Hamlet, hitting all the same marks, reciting all the same lines, cannot each one bring something unique to that role? So it is tax season and I'm off to drop my forms off with Jerry Chyo, my CPA and I'm thinking even though this is not food related, I should mention Jerry on here. I'm not mentioning him simply because he offers a referral bonus but because he offers many different services that could come in handy for restaurateurs and other business people that require bookkeeping or payroll services as well as tax preparation. Check out Jerry, he is not your stuffy pencil pushing CPA. Look him up at TheRenegadeCPA.com and give him a call or shoot him an email. The weekend starts off at the Big Sur Lodge in the Pfeiffer Big Sur State Park, with a reception featuring most of the local restaurants, and a couple of surprise invited guests, featuring what they do best, only enhanced with the earthy and rich chanterelle. The following morning, the Fungus Federation of Santa Cruz lead a walk through the State Park on a mycological exploration. Following this, there will be a panel discussion about the mushrooms found on the walk, as well as how they are indicator species for the health of a forest. 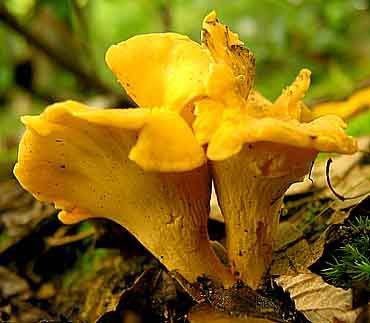 At noon on the Saturday, there will be the Chanterelle Cook-Off! Local chefs, professional and non-, will be vying for various prizes based upon such criteria as Presentation, Taste, Originality and others. 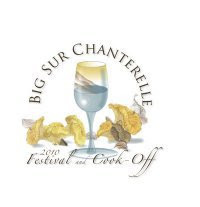 Come and taste a wide variety of chanterelle recipes and drinks (yes, we have beverages made with the mushroom! ), taste great wines from Morgan, Galante, Hahn, Talbott and Heller, and vote for your favorite dishes. And then, on Saturday evening, come and sit with the chefs and enjoy a sumptuous meal in the Lodge dining room and cheer on the chefs as they receive their awards. Seats are limited for this dinner, so please call and book early. 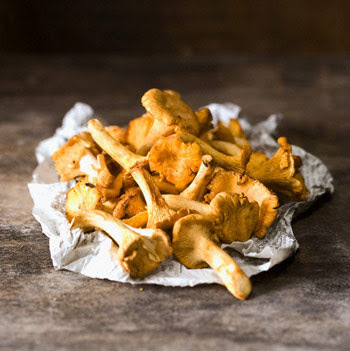 To top off the weekend, come to the Redwood Grill at Fernwood Resort on Sunday morning at 10 am for a chanterelle brunch served by chef Dave Dildine. All proceeds from this weekend's events go to the implementation of the Big Sur Victory Gardens Project. Our goal is to establish sustainable and organic small gardens throughout Big Sur to encourage consumption of fresh greens and vegetables and to teach low and middle-income residents the benefits of a healthy organic diet. Tickets are available at www.bigsurchanterelle.org.